So much of the food and household products we use on a daily basis come in cans – baked beans, tuna fish, pet food, paint... all available to us to an easy to carry, convenient-sized can. They are easy in almost every respect apart from ... recycling. The major environmental problem with the process needed to make metal cans, be they steel or aluminum, is the mining of the raw material. The second problem is how to deal with the waste product – metals are known to leak ferrous oxides and a whole mire of toxic chemicals through the soil, which will spread and be present for years. What Type of Can, and What to do With it? You can tell whether the empty can is steel by placing a magnet on it. If it sticks, and it will usually feel heavier and more solid than most aluminum drinks cans, then it is steel. For more detailed description of the process of recycling aluminum, and some tips of how and where to take your drinks cans, see our page about that on this site. Every steel product you buy will have some element of recycled steel within it, probably a minimum of 25%. It is highly worthwhile for the metal industry to recycle steel, as it is extremely cost effective. As it is magnetic, steel can easily be sorted and melted. In North America, the recycling of steel has been increasing since steel production launched over 150 years ago. For every ton of steel that is recycled, 1150 kg of iron ore, 650 kg of coal, 55 kg of limestone are saved. This massive saving is of raw materials that would have been used to produce one new raw ton of steel. Scrap steel is fed into a furnace – either an electric arc furnace, which is used to make bigger industrial products for engineering, or the basic oxygen furnace. This latter converter is more often used for smaller products such as cans and car parts. Within the oxygen furnace, virgin molten iron is fed into the heated steel. Then a lance is introduced to the mix, which blows a high-quality oxygen in to the steel and iron. This process helps to remove any impurities within the metals.The furnace reaches a temperature of 2000 degrees C, and basically cooks for half an hour. This temperature refines the metals into a high quality recycled steel, which can then be cooled and worked with. Feed Your Steel to the Recycling Bin! Firstly, we need to be aware of the amount of metal materials we are using on a daily or weekly basis, and cut down. Investing in the technologies to recycle is important, but reducing our use of and dependency upon these products is crucial. Sort your steel cans out by first checking they are steel, then ensure they are washed. Ideally, any paper covering, such as that used on tuna tins etc, needs to be removed. 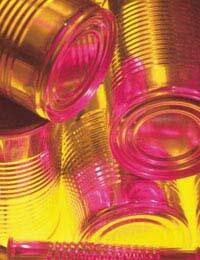 Find out if your local Council collects steel cans in its curbside collection box. If not, there should be a collection point at your local large recycling facility. If not, petition the Council for one! Aerosol cans can also be recycled, but only when empty and only with great care. Consult staff at the recycling facility for advice about this. This was very helpful. Thank you for this information.